Actually, it has been "Spring" for over a week now. So, it would be nice for the sun to make an appearance one of these days. But, I guess Mother Nature has other plans for us at the moment. Speaking of plans, dinnertime came upon me rather quickly today, so I scrambled to find something simple yet satisfying to make. I decided to go with veggies and pasta. So, I put on some water for pasta and browned some sliced chicken breasts in a pan with butter, garlic, and a bit of chicken broth. When the chicken was cooked through, I added in some baby broccoli -- stems and leaves, too -- as well as some oregano, basil and parsley. I reduced the heat to low and let it simmer uncovered while the pasta boiled. 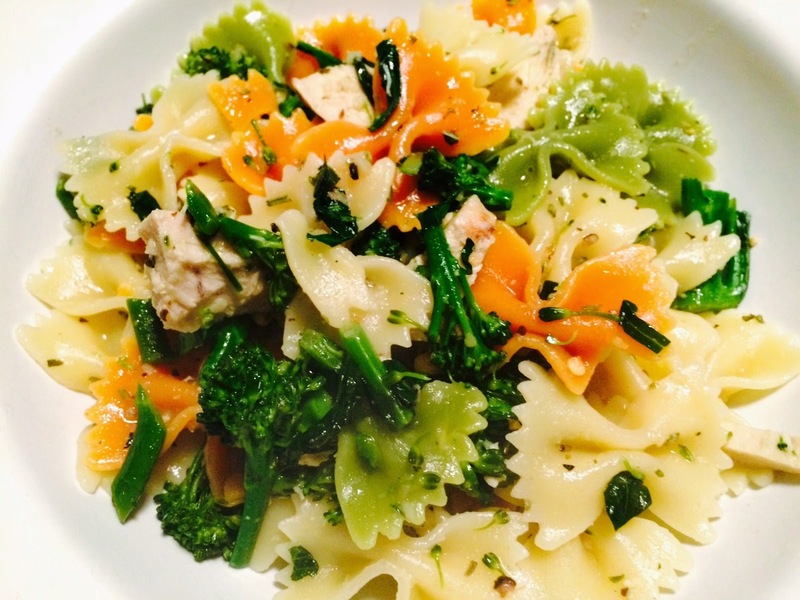 (I had some tri-color farfalle which seemed rather "Springy.") When the pasta was done, I drained all but 1/4 cup of the liquid from it, then added the chicken and broccoli mixture to the pasta pot. All it needed was a generous sprinkle of salt/pepper and a good toss to combine everything. Served in deep bowls with some crusty bread and a simple green salad on the side, our springtime supper was ready in no time. Now if only that sunshine could hurry itself up, too.